Thought provoking statements. 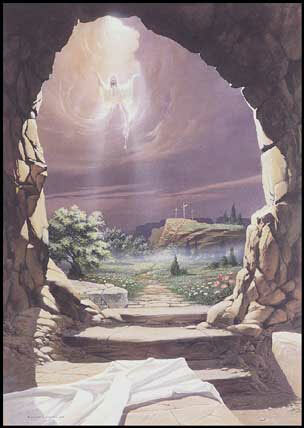 It is true, without the resurrection the crucifixion really has no relivance.Going to Easter service tonight (Sat.) Church has 10 services this weekend. One last night, 3 tonight, 4 tomorrow. Hubby and I are on coffee duty for all of tomorrows services. That means we get to church at 5:15AM! After all the services its dinner at our house for 12. Thank goodness everyone pitches in. We also have 2 services going on at the high school which will have live worship(daughter in law sings on that team)and simucast sermon. I think all in all they are expecting 20,000 or more, for the 10 services. Happy Easter to you, Bob. Thank you for sharing these. I met EM Blaiklock in 81 I think it was - to sit at the feet of such a Biblical Scholar was amazing!!! The Resurrection happened indeed - if not, we of people are to be pitied. Nice to meet you! I am a friend of Susan's. Your name caught my eye as my hubby is a Kansas native. And then I kidnapped him and brought him to Missouri. Thx for stopping by minpinmom! Where about in Missouri do you live?